Nick Clegg, the Liberal Democrat leader, sinking in the polls and suffering the media persecution which goes with that, thinks that newspapers won’t be around when his children are grown up. He implies that because printed papers might vanish, journalists of the future won’t pick apart the performance of politicians. Or at least they’ll be nicer when doing it. Less naive, but nevertheless mistaken is the idea floated by David Leigh of The Guardian (declaration: he’s also a colleague at City University) that the financial problems of newspapers could be solved by a £2 a month levy taken from internet service providers (ISPs). Journalism has always been cross-subsidised, so it’s the right question. But the wrong answer. Taken together these fragments of the debate about what’s happening to journalism show that a stark idea, long discussed by those who study this stuff, has now gone mainstream. Change in newspapers will be transformative and not just adaptive. And it’s coming very soon. Take a quick look at the recent print circulation figures of the five serious national dailies (FT, Times, Guardian, Telegraph, Independent). Taking the figures from June 2011 to June 2012 (i.e. excluding Olympic effects) year-on-year falls range between 8.52% (Telegraph) and 44.62% (Independent). Take the Independent out of the equation on the assumption that the figure is distorted by some statistical manoevre and the bracket is from 8.52% to 17.75% (Guardian). Now imagine the effect of those numbers on print advertisers (still probably at least two thirds of the income of these papers) and speculate about the tone and type of discussions that are going on inside the offices. Because no management with an existing print business can yet see financial success and salvation in online, the print business is being cut back. Here’s an example of how Newsquest, the British arm of the giant American chain Gannett, did that with the Herald in Glasgow. Nick Clegg’s hope that journalism will be kinder to the Liberal Democrats when today’s newspapers have gone into the dustbin of history confuses content with platform. Politics is a fight: it’s supposed to be. On the web, in print in the eighteenth century, live on radio or TV it was, is and will be vicious. Even if The Sun, the Daily Mirror and the Daily Mail were to disappear in the next twenty years (not probable all in all), politics will still be fuelled by a mixture of high principles and ideas crossed with mischief-making and gossip. Just look at Guido Fawkes. The tone of political coverage is a function of the culture of politics and journalism, not of the fact that the coverage is in the form of inks marks on squashed trees. David Leigh’s suggestion for a levy on ISPs has been knocked because it’s unfair or unworkable as an economic remedy: it’s a big percentage rise in a monthly broadband household bill, it would reward publishers unevenly and so on. Check out the comments underneath his proposal: I’d have expected Guardian readers to have been more sympathetic to the idea of subsidy, but they’re sceptical. I think the strongest arguments against Leigh’s idea aren’t strictly financial. Propping up journalism organisations by public subsidy only postpones the inevitable and reduces the incentives to replace the bust business model with a new one. Journalism and its platforms have regularly been re-invented through history and we’re in one of those phases right now, like it or not. Consumers of news, however passionate they might be in defence of their favourite title, never paid the full price for the journalism they enjoyed: advertisers made up the difference. The trick now is to experiment to find replacements. The fact that journalism’s institutions are having a hard time does not mean that journalism itself will evaporate. There’s a level-headed look at this on Charlie Beckett’s Polis blog here. Expect to hear more about “synergies” from newspaper companies. Three years ago, The Guardian discussed and then ditched a plan to absorb its Sunday sister The Observer igniting a small media-world bonfire (I once worked for The Observer and was chucking firelighters myself). Will that plan now be dusted off? And what about The Times and the Sunday Times? Hitherto they have always been kept editorially separate, but I can’t see that assumption surviving intact for very long under these kinds of pressures. In the case of those two papers, there’s an additional complication: does merging editorial functions risk breaching the undertakings which Rupert Murdoch gave to Parliament when he bought them back in 1980? That would be sensitive territory in the post-phone-hacking political climate. I’ve predicted before that the next big development will be a major paper switching off its printed edition. 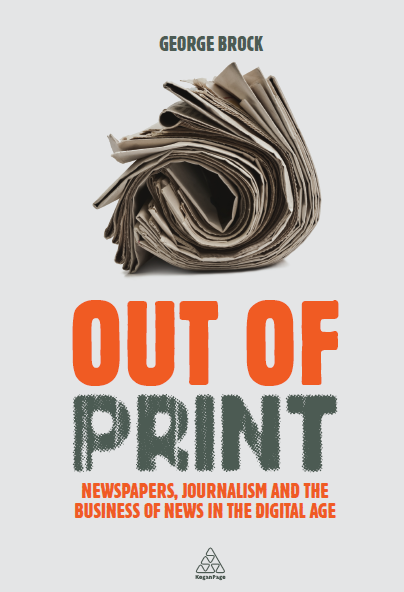 That might not necessarily be a complete print shutdown: the first step might be to reduce the frequency of print editions. My money’s on the Financial Times to be the British first mover. (Small local London example here). But the other signal that things are changing at a basic level will the purchase of a world-renowned title by a new media company. Google casually admitted a few years ago that they had thought about buying the New York Times. It would be astonishing if Bloomberg hadn’t thought about the same thing (explanation of how easy that would be here). Would Rupert Murdoch’s successors and/or children unload one or two major titles? He has never wanted to; but the next generation might disagree. That’s the change: all this is now thinkable. This entry was posted on Tuesday, September 25th, 2012 at 9:33 am	and is filed under Media Economics, Predictions, UK Press. You can follow any comments to this entry through the RSS 2.0 feed. Both comments and pings are currently closed. Excellent post George. Two tiny points. Firstly, the FT might well keep it’s print edition because the Saturday one especially is such as advertising attraction (How To Spend It) and because its readership will probably pay £5 for it. The other point is the Observer. I just can’t see how they can possibly justify two operations. I fear the fact they’ve resisted for so long is a symptom of the triumph of internal culture over external reality at Kings Place. Overall, I think David Leigh will be just as cross with your post as with mine as it doesn’t come up with a sure-fire way to guarantee his continued working life-style. Ideally, one that involves nobbling the despised Internet companies that produce stuff that people actually value.